In some cases, I'm sure digital learning or distance learning can have a positive effect. In an article I wrote called How to Make Training “An Affair to Remember I didn’t talk a lot about different training methods; I was concerned mostly with the trainer’s role and responsibilities in making classroom instruction most effective. For a long time I highlighted this point on my website. Even though some time has passed, I still think the ideas are valid. My training group on Gov Loop received a question which merits a revisit to that article. Here’s the question: Do you think this [article] refers only to traditional training methods – or can it also be applied to e-learning and distant learning? Is there a way to capture the charisma and energy Shaw highlights in digital training modules? As a public speaker, psychologist, actor, director as well as a trainer, I believe we all need an audience to interact with us–even if it is unperceived by the audience itself. This is in the form of biofeedback. You can make e-learning and distant learning more exciting with dynamic presenters, however, the biofeedback is hard to add. Whether online digital even with video of individuals, and dynamic special effects has the same effect on learning is suspect. In some cases, I’m sure it can have a positive effect. In others, I’m not so sure because some people are simply more prone to respond to others who respond to them in some direct fashion. How much effect has not really been studied, but the ads for these programs would have you believe they do indeed have a healthy impact. They are certainly cost effective. With either training method, there is little direct feedback the presenter can see (or sense) in the audience and adjust his or her presentation for that particular audience in the moment of time it is occurring, if at all. With pre-packaged programs, there is none at all; the closest you can get is anticipating audience reactions. Still not optimum. I’m not saying there is not a place for this kind of training, but it can’t compare with the right trainers motivating and working with an audience, and immediate learning taking place. E-learning and distance learning, for the most part, are designed to reach more audiences or audiences that can’t be reached by traditional methods. It’s also cheaper. Some e-learners can learn with applications that involve the students interaction and learning by doing as opposed to or in conjunction with seeing and hearing. It’s not the same thing; however, I won’t deny it can be effective for some. Generally speaking, people probably do not learn best by this method or even stay attentive. Going back to my experimental social psychology days in graduate school, I suppose we could place electrodes on their fingertips, brain or elsewhere on their body and when they drifted off zapped them to attend to the subject at hand. It might result in getting their attention, but not making sure learning took place. We know learning takes place best when it is self-motivated. Ironically, a blended teaching and training method is taking hold. It’s not just the Corporate Universities, or the pragmatic universities like Phoenix, DeVry and others whose market is mostly those who work and don’t have time for a traditional college-level program, but many traditional universities teach many blended or online courses to cut down on class time and costs. In some classes it can be more effective, but how valid is it in a public speaking class or a class that needs lots of time in face-to-face discussions? It’s not much different from training. There is a different between what people say online and how they say what they “say” (subtext included) in a face-to-face discussion; the same goes for class room training or coaching. Body language plays a part, especially questioning or puzzled looks, I-don’t-understand looks, I-don’t-agree-but-I’m-not-going-to-say looks. These are times you can adjust. With the other methods, you can’t adjust if you don’t see it. 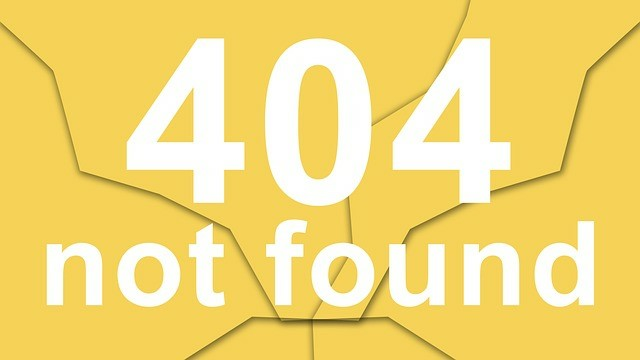 A more dynamic presenter can add “charisma” and even a dynamism with some creativity to e-learning and distant learning modules, but it still loses something in the direct connection. Keep in mind that the stage is different from the television or the computer screen in the actual performance approach by the trainer. Just like acting for the stage is different from acting for television or film; one is a distance medium and the other is filled with close-ups. I would treat the e-learning and distant learning as a close-up performance because your audience is mostly intimate. You can assume otherwise, but I would say the same rules apply. By the way, if you are talking teleconferencing, remember that even radio announcers use mirrors to give them the feeling they are talking with a real audience instead of an imagined ones. It’s hard to make numbers of people real, but that is one technique to make it easier, believe it or not. Ask any DJ whoever did a show in an empty studio. Should work for podcasts, too. 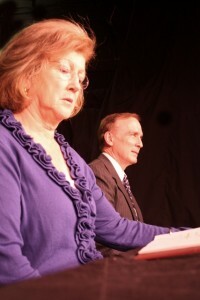 Miriam Reichenbach and Frank Myers star in LOVE LETTERS, playing at Sketch Club Players of Woodbury, NJ. It bothers me a bit that we are losing our direct contact with our people through our wonderful technology, but hopefully, we can adapt as we go to get the feedback or make the best of what we do receive. My novel, hopefully out this year, deals with the subject of what happens when we stop talking face-to-face and rely only on the devices for acceptable communication. There’s an interesting play, LOVE LETTERS, that I reviewed for STAGE Magazine. 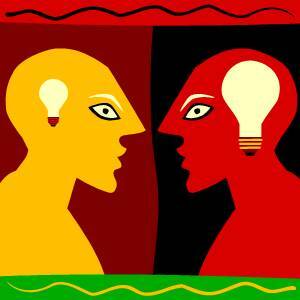 In the play, a couple are separated but write each other all the time. What the audience sees on stage are actors reading the letters, but the letters tell the back story, which loses a bit as the audience sees what happens without face-to-face communication. Letters are cleaned up; versions are adapted to ensure the person receiving them gets exactly the message we want to send. The point of the play is that the subtext that is missing or words and feelings left out for the sake of brevity may be important, too, leaving unanswered questions and even miscommunication. The same can be said for digital learning, and, in fact, any kind of training that does not take place where the trainer can see his or her audience and react to them. Even an actor, with lines memorized, does not act in a void. An actor wants an audience because it makes the performance complete; it also makes each performance a little different. So, it should be with training. That’s my opinion and I stand by it. As always, I welcome opposing views and if there is research out there, I’d love to see and post the statistics for all to see–either way. My other “outrageous” writings are available on my website, or in my new e-Book, The Cave Man Guide to Training and Development, which is a common sense guide to training and development. Personally, I think it takes you back to thinking what training is all about from the beginning rather than finding a single focus to ply your trade. But I would be wrong to say I haven’t found my niche, and it’s a passionate one. We go with our strengths and I hope I’ve made the right choice for me just as I hope for you have for yours. I’m here for you. Have your say and come back often. I’m pleased to have guest bloggers who have different points of view or focus on one aspect of training. speaking of which, Sandy Cormack will be back with Unlocking Creative Potential – A Neuroscience Approach, Part III. It’s good to learn to stay fresh and stimulated. Happy Training and Happy Holidays.